This week I started my class at Material Obsession. It was so much fun and I just wish I had a full day instead of just one stolen morning. 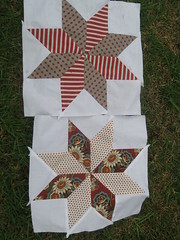 I already learned so much and wish I had been there to learn a few tricks prior to my attempt of the star baby quilts. We are into full swing with big school and I can’t believe how big the transition was from preschool to kindy. We are having a few nights of major tears over minor infractions. Off to sew with my stars. They are slow going because of all the attention to detail in cutting and marking, but worth all the painstaking prep to have them sew up sans dramas. 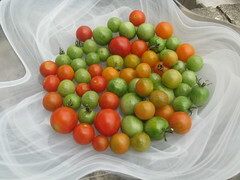 I have been trying to beat the possums to our summer tomatoes with little luck. Here are some of the survivors of the heat and possums. I am extremely impressed since my gardening efforts are very limited. They taste and smell delicious and just burst in your mouth with freshness. I feel like I have won lotto! I snuck into the last class spot at Material Obsession. After major reorganizing of schedules, music classes and my babysitter I am ready! Taking a class was my new year’s resolution this year and I can’t believe my stars have aligned this early to make it happen. 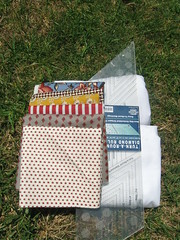 I visited the shop today to talk about the project and buy some starter fabrics. I am on the pre-project high and can’t wait to jump in. I just finished the plane quilt top that is now awaiting borders and backing fabric. I have also been working on a small hand quilting baby quilt on the quiet nights in front of the television. I have to admit things have gone a lot slower and I think this heat has just killed my craft drive. Rhys also started Kindergarten and that was a very big moment for all of us. Four more sweltering days ahead of Sydney. I am embracing the pool, beach and any shop that has air con.